Last stage of the Winter Cup was held in the basement under Skejby University Hospital. The course was very technical and I did a lot of mistakes and didn't manage to get a good feeling of the map. This resulted in a position as 3rd last after the handicap, that's not quite what I'm use to. I ran with GoPro so you can see some of my race and get a feeling of how difficult it was and get a laugh when you see my mistakes. It has been a long time since anything has happened here. So I just wanted to give an update to what is going on here in Aarhus. Every winter we have a very prestigious cup called 'Vintercup'. It's a series of races where everyone from the club has a chance to win. The reason for this is that we use a sophisticated(read subjective) handicap system based on peoples level. For me this means I have 105 that is I get 5% added to my running time before the final result. New runners might have a handicap of 50 or so. We strive to have winning times around 15-20min so this is truly for all. It is some really fun races and it is even more fun because I'm in the overall lead halfway through the series. I have this as a goal and a motivation through the winter training so I don't forget what it is like to compete and be at your best when you want. 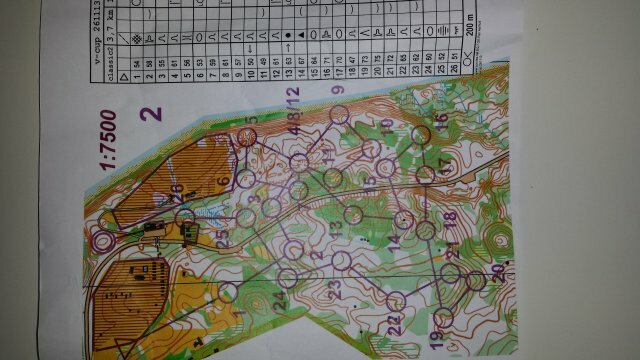 I also think it is good to try to orienteer in 'overspeed' sometimes and coop with these challenges. Next race is on Tuesday where we are running sprint in the basement under the university hospital here in Aarhus. Think this will be very exciting and new so I'm really looking forward to this.